Morgan Shepherd picked up the 16th last-place finish of his NASCAR XFINITY Series career in Saturday’s Irish Hills 250 at the Michigan International Speedway when his #89 Racing With Jesus Chevrolet fell out with suspension issues after 19 of 125 laps. The finish, which came in Shepherd’s 408th series start, was his first of the season and his first in an XFINITY Series race since February 28, 2015, when his #89 Racing With Jesus / Courtney Construction Chevrolet fell out with suspension issues after 2 laps of the Hisense 250 at Atlanta, 77 races ago. Shepherd now ties Matt DiBenedetto for 3rd-most last-place finishes in XFINITY Series history, and ties Joe Nemechek for the second-most all-time. 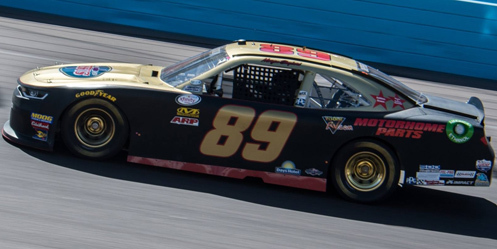 Shepherd’s fiftieth year in NASCAR continued into Michigan last week, where his black-and-gold #89 Chevrolet glimmered from the far end of the XFINITY Series garage. With exactly 40 drivers arriving to make the 40-car field, Shepherd was assured his 12th XFINITY start at the track, a track where his best finish was an 11th in 1995. He’d competed even better on the track in his 36 Cup starts there, earning a pair of runner-up finishes in 1989 (behind Rusty Wallace) and 1993 (trailing Mark Martin). Michigan would also be Shepherd’s sixth start of the season and third in a row, following back-to-back 38th-place runs at Dover and Pocono. He hasn’t finished a race under power since September 28, 2013, when he ran 27th at Dover. But that didn’t stop him from running 32nd in Friday’s opening practice or timing in 37th on the grid with a lap of 178.802mph, besting David Starr in B.J. McLeod’s #99 Victory Lane Quick Oil Change Chevrolet, Timmy Hill in Motorsports Business Management’s #13 Toyota, and last-place starter Mike Harmon in the #74 Heart For Heroes / Veterans Motorsports Dodge. On race day, Harmon was joined at the rear by Daniel Hemric, his #21 Blue Gate Bank Chevrolet sent to the back for unapproved adjustments, and GMS Racing’s new #96 Weber Grills Chevrolet of Ben Kennedy, whose team changed tires after qualifying. Both drivers had hardly any time to improve their position when the first caution flew heading into the first corner. Polesitter Kyle Busch moved up the track, but wasn’t clear of Brad Keselowski’s Ford, sending Busch sliding into the grass. Busch narrowly missed the inside retaining wall and managed to rejoin the race, ultimately rebounding to finish 5th. The rest of Stage 1 ran without a single caution flag, though during this time, several LASTCAR contenders ran much longer than usual. All-time last-place leader Jeff Green, back in RSS Racing’s #93 for the third-straight race, ran 44 laps before he retired with a vibration, the first time that car has run more than 17 laps all year. The lap count left Green outside the Bottom Five in 35th, one spot behind the unsponsored second King Autosport entry of Josh Williams, a team making its 2017 debut. Shepherd himself ran 19 laps – the most he’d turned since Dover – but finished last just the same. Timmy Hill pulled the #13 out of the race the next time by. The rest of the Bottom Five was filled by the day’s biggest accident on Lap 39. A four-car tangle exploded down the backstretch when Brandon Jones lost control of his #33 Nexteer Automotive Chevrolet down the backstretch. As the pursuing Ben Kennedy slowed to avoid him, he was rear-ended by both Michael Annett’s #5 Pilot Travel Centers Chevrolet and the unsponsored #14 of J.J. Yeley. Kennedy, Annett, and Yeley all rolled away from the scene with varying amounts of damage. Annett and Yeley fell out while Kennedy limped around the track with rear-end damage before he retired three laps later. *This marked the first last-place finish for both Shepherd and the #89 in an XFINITY Series race at Michigan, as well as the first time the last-place finisher of a race at the track fell out with suspension issues. What happened with Obaika Racing?